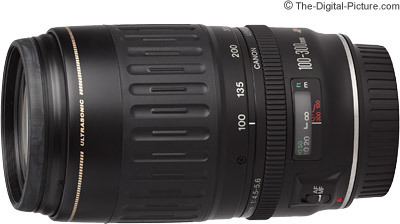 The Canon EF 100-300mm f/4.5-5.6 USM Lens is a mid-grade long telephoto zoom lens. Introduced in 1990, the 100-300 is built reasonably well. The finish does not appear modern, but the build quality is decent. A metal lens mount shows that the 100-300 is not a bottom-of-the-line lens. AF is very fast and quiet. The Canon EF 100-300mm f/4.5-5.6 USM Lens utilizes Ring USM (Ultrasonic Motor) focusing, and FTM (Full Time Manual) focusing is an included feature. The MF (Manual Focus) ring is very small and wobbly - It is not as easy to use as it could be. The zoom ring, on the other hand, is too easy to use. The 100-300 will extend all by itself when hanging downward. At 1.2 lbs, the 100-300 is a mid-weight lens. It feels substantial in your hand. 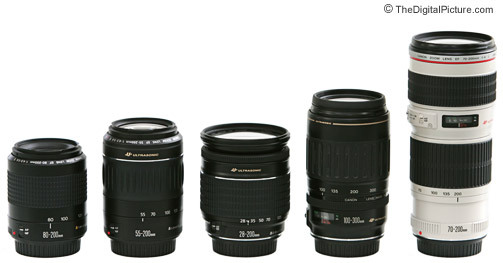 From left to right in the picture above are the Canon EF 80-200mm f/4.5-5.6 II Lens, Canon EF 55-200mm f/4.5-5.6 II USM Lens, Canon EF 28-200mm f/3.5-5.6 USM Lens, Canon EF 100-300mm f/4.5-5.6 USM Lens and Canon EF 70-200mm f/4L USM Lens. 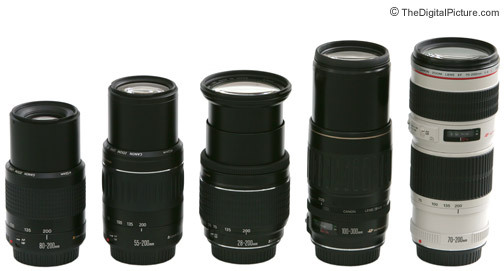 The same lenses are pictured below extended to their maximum length. Featuring an 8-blade aperture (very good), the Canon EF 100-300mm f/4.5-5.6 USM Lens is not a fast lens. Starting at f/4.5, quickly moving to f/5.0 around 115mm and on to f/5.6 near 180mm. Handholding this lens at 300mm is going to require lots of light or high ISO settings to get shutter speeds high/short enough to prevent camera motion blur. Combining a long minimum focusing distance (4.9') with a high focal length, the Canon EF 100-300mm f/4.5-5.6 USM Lens turns in a mediocre .2x magnification ability. I found 100-300's sharpness to be decent (not excellent) when stopped down at least one stop from maximum at most focal lengths. Vignetting is well controlled with 300mm f/5.6 showing the worst performance in this regard. CA (Chromatic Aberration) is also well controlled but apparent at the long end. Slight pincushion distortion is visible at most focal lengths even on a 1.3x FOVCF body. The Canon EF 100-300mm f/4.5-5.6 USM Lens provides reasonable optical quality in a wide focal length range with fast Ring USM autofocus for a reasonable price.